WE ARE COMPLETE IN CHRIST →→ THE RIGHTEOUSNESS OF CHRIST →→ THE FAITH OF JESUS CHRIST →→ SAVED IN SIN OR FROM SIN? Can you see what the apostle is saying above? What does true faith do? It WORKS. And not just that, it works BY LOVE. There are many professed Christians in the world who are in two categories, and BOTH categories are NOT of faith. The one says that we just need to 'believe' in Jesus, going no further, and not experiencing a true sanctifying life of faith. And the other says that we must do works to be saved. I would not want to be in either category. No, what the apostle Paul confirmed is what REALLY COUNTS, and that is a "FAITH that works BY LOVE.". Is there a contradiction between Paul and James? No, as James also confirms that righteousness was imputed to Abraham due to his faith in God. But James takes it a step further, a step that many Christians today are afraid to take. James confirms that Abraham's faith "WROUGHT with his works". Now that word 'wrought' in the original language means to 'help'. In other words, Abraham's faith (of which was imputed to him righteousness), HELPED him to work. And that's what true faith will do for all of us. It will CAUSE us to work. Abraham was a 'doer' of God's Word (James 1:22), BECAUSE he believed in God and His promises. Abraham had a "FAITH that works BY LOVE". So if we abide in Christ, then we will bring forth fruit [works], because Christ will be in us doing the work. But if we are not bringing forth fruit, then that shows we are NOT abiding in Christ and will be 'cast into the fire'. This is a serious message that we must understand. Now I ask this question to people who have been professing Christians for a long time. Are you doing the 'works of Christ'? Can you 'boast' of having faith and being saved and yet at the same time manifest no good works in your life? Look at the apostles and disciples of Christ. Did they simply boast about having faith? No! They were DOERS of the Word. They laboured day and night for the gospel and allowed Christ to perform His works in and through them. Look at our church pioneers. Did they simply boast of 'faith'? No! They too laboured day and night for the gospel, allowing Christ to work in them. They all had true faith - a "faith that works by love". Why did Paul 'labour more abundantly' if he preached a 'believe only' message? It is because he did NOT preach a 'believe only' message. He preached a message of "FAITH that works BY LOVE". It is faith that compels us to work. Our own works cannot redeem us from sin. Only faith in the life, death and resurrection of Jesus Christ can save us. But that faith, if it is a genuine faith, WILL WORK. Now this is the key to this whole message. We are to have the mind of Christ. Now what did the mind of Christ do when He was on earth? He surrendered self, had complete faith in His Father, kept the Father's commands perfectly, performed the Father's works, healed the sick, preached the gospel, and much more. Now is the mind of Christ any different now than it was then? No! So if this mind is in us, what will this mind COMPEL us to do? The works that Jesus did (John 14:12). So the REAL question is, do you have the mind of Christ? So we can see that self needs to be crucified in order to have the mind of Christ and Him living in us through faith. THAT then becomes a LIVING faith; a true, genuine faith that works the works of Christ. And we can then understand what the apostle James was saying that 'faith without works is DEAD'. This means there are TWO kinds of faith - a LIVING faith that saves and a DEAD faith that does nothing for us. A living faith is one that allows Christ to dwell in us, surrendering self and the world, and allowing Christ to do His Work is us. A dead faith is one that James spoke of. One that thinks you only need to simply 'believe' in Jesus without allowing Him to CHANGE you and WORK in you. So in saying all of this, we must be careful to have the proper order of things. Remember, we need the mind of Christ in order to work. So that is what we are to do. Do not get your mind on works for salvation, fearing that you will be lost because you are not doing enough works. Get your mind on Christ IN ORDER TO WORK. And as we behold the lovely Jesus each and every day, surrendering self, allowing Him to put His mind in us, He will CAUSE us to work for Him. Yes, we are saved by the grace of God through faith. But faith does not sleep. Faith does not slumber. Faith is not lazy. Faith is not selfish. True faith GIVES ALL, just as Jesus Christ GAVE ALL for us. 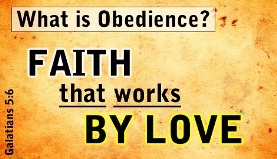 This is what obedience and true faith is. It is a "faith that works by love" (Galatians 5:6). "Let this mind be in you, which was in Christ Jesus." - Are you surrendering self in order for Christ to work?